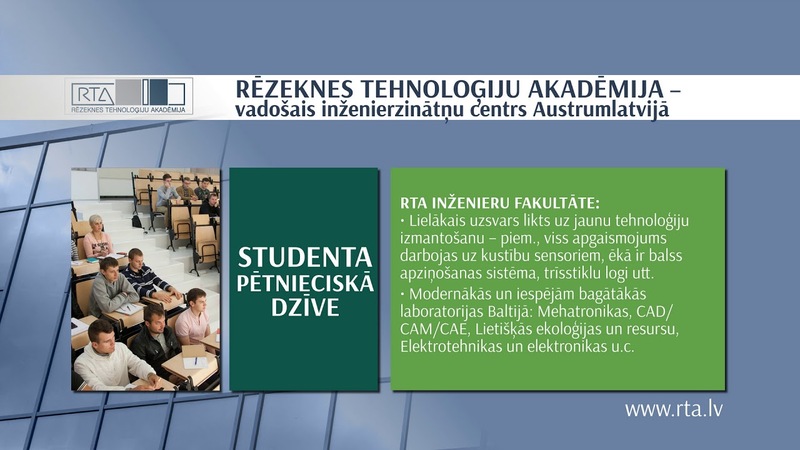 Rezekne Academy of Technologies is the second higher education institution in Latvia who has decided to prepare its own intending students. Eastern Latvia Technology High School (ATV) provides STEM (science, technology, engineering, and mathematics) oriented education, promoting students’ ability to study and develop independently, motivating them for lifelong education and deliberate career in engineering or technologies. ATV vision – The school that offers modern technical education to every young person`s future development. The goal of the ATV is to prepare intending students for study programmes related to engineering, metal treatment, information technology etc. Therefore, great emphasis is placed on mathematics, physics, chemistry, engineering drawing, informatics, and foreign languages. During the study process students are involved in various projects, work groups, internship, and study tours to various enterprises. Study premises are located on Atbrīvošanas aleja 90. However, to ensure modern study environment, physics and chemistry classes are held in RTA Faculty of Engineering where the latest equipment is available, and programming and informatics classes - in RTA Information Technologies Centre. ATV students are also welcome to use the infrastructure of RTA while performing their research. For regional students ATV offers accommodation in RTA Student dormitory on Maskavas iela 22. More information is available at ATV home page at http://atv.rta.lv/ . Follow us: facebook/ @atvsk .